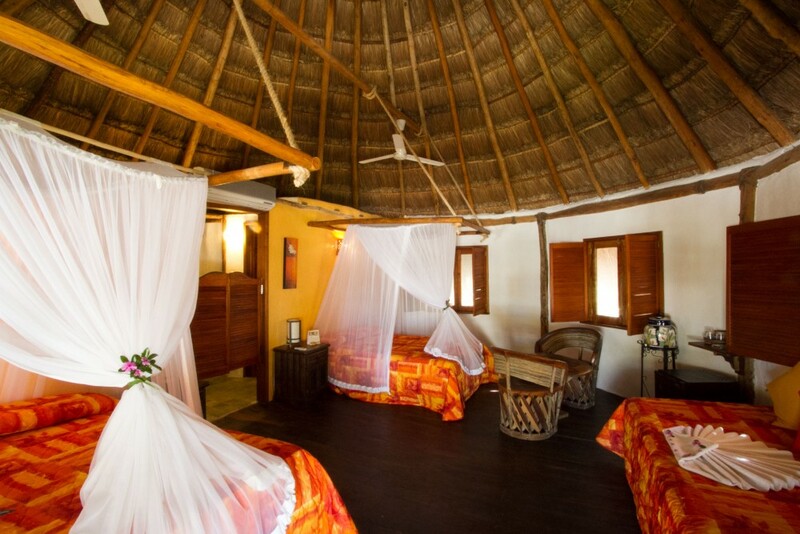 Simple and charming ecological hotel on a small, uncommercialized island. Great for a low key beach vacation. The island’s town, which is within walking distance, is cute and colorful and has some surprisingly good restaurants. 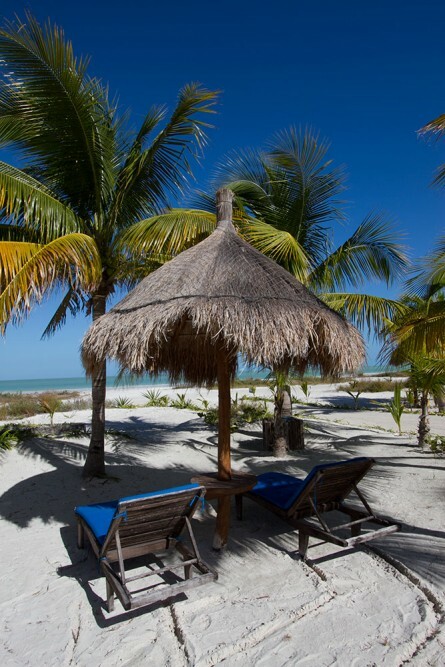 The little island of Holbox is about three hours from Cancun by road and boat; an adventurous journey that takes you far from the tourist trail over minor roads and via local ferries or small launches (transfers are available). 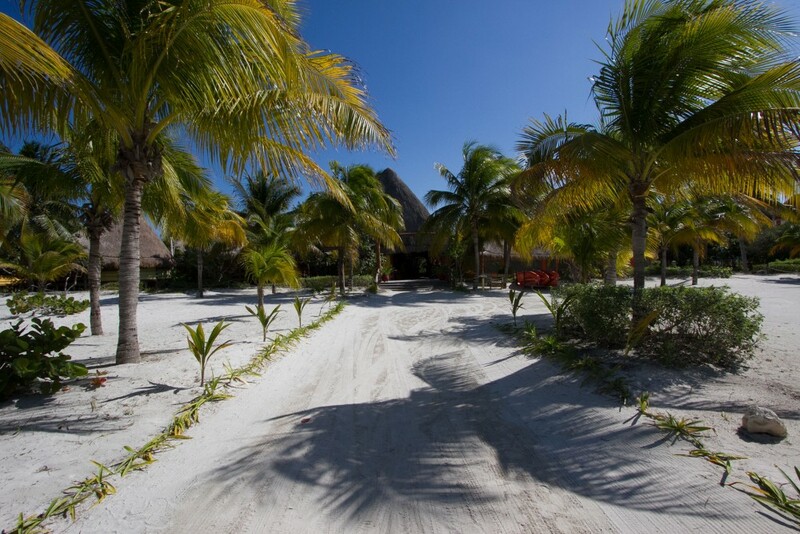 But the journey is worthwhile, for at the end you’ll find Villas Delfines, an enclave of thatched-roof casitas by a wide and deserted beach, a natural paradise and a perfect escape from the crowds. 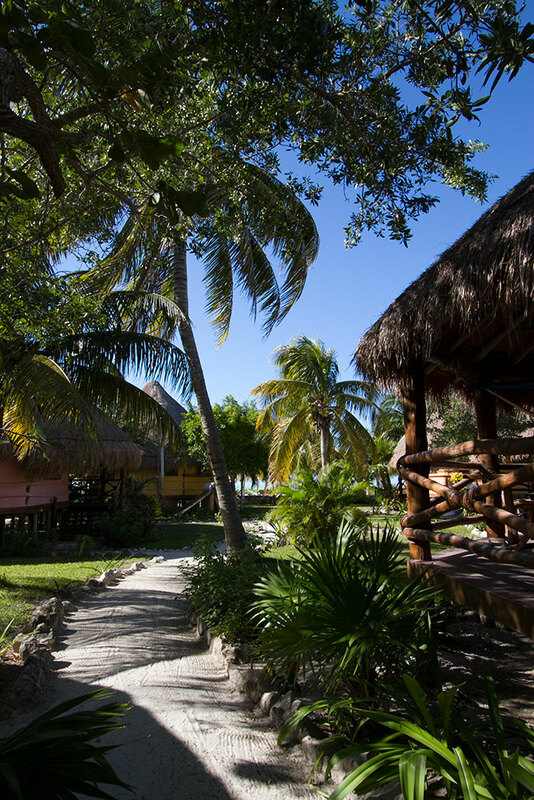 Most people come to Villas Delfines to relax; to appreciate the simplicity of life without cars, televisions and computers; to wake with the sun and to enjoy blissfully tranquil days snoozing in hammocks, eating delicious seafood and strolling along the beach at sunset. 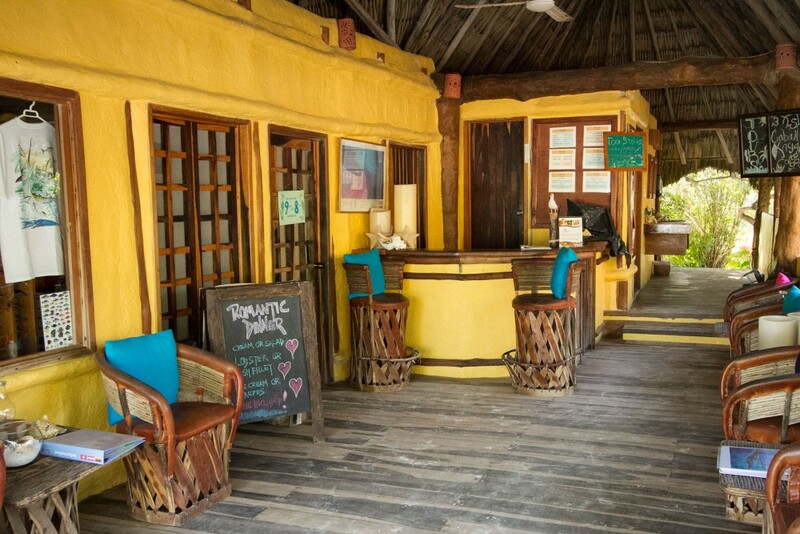 The island’s town has sandy streets and colorful houses, and there’s a surprisingly good selection of quality restaurants to discover. 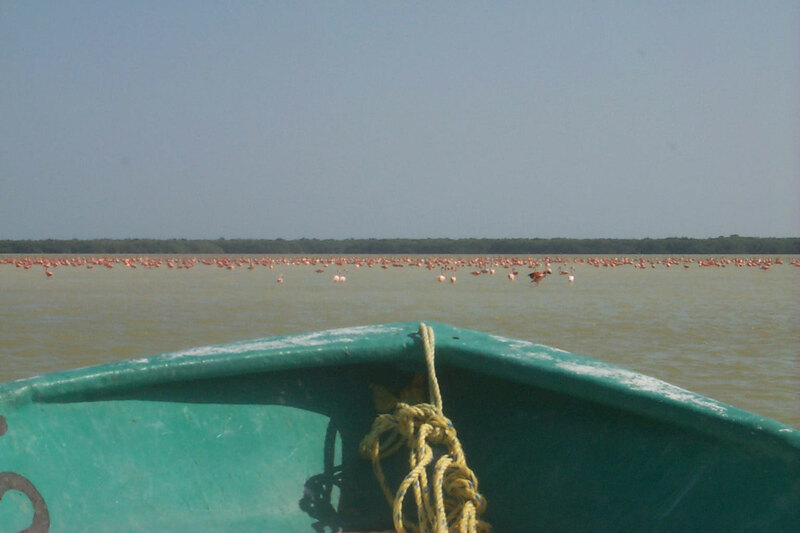 It’s also a great destination for fishing and bird watching, and the hotel offers some excellent excursions. We recommend at least a boat trip through the mangroves, or a visit to the nearby bird sanctuary of Isla Pajaros, but you can also go in search of dolphins in their natural habitat throughout the year or take an unforgettable whale shark tour between June and September. Whatever your reasons for visiting, Villas Delfines is certainly worth a visit of at least three nights – most people stay for a week or more. The enchanting casitas, with their huge terraces and hammocks, are idyllic tropical hideaway cottages and they are also big enough to accommodate a family with two or three children. Kids will love the huge beach with its powder soft sand scattered with seashells, and the blue-green waters are generally very calm. 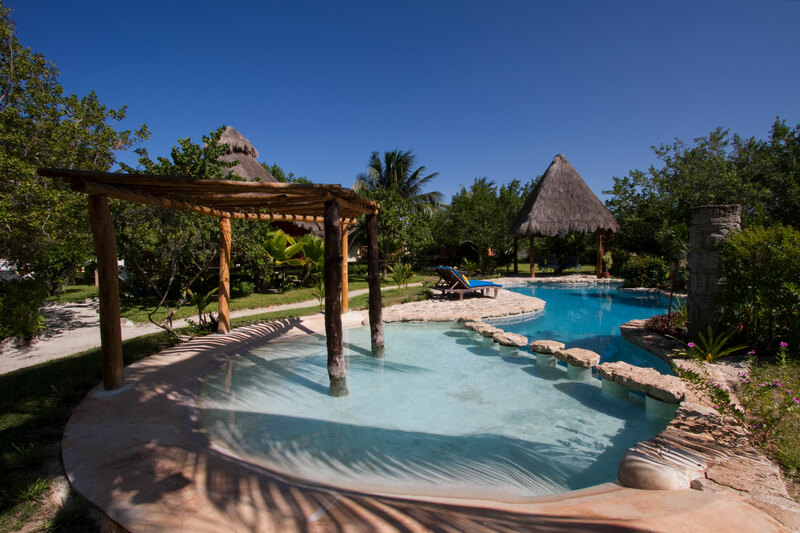 This is definitely not a place to visit in a rush, but it’s one of the closest destinations to Cancun offering total tranquillity and environmentally friendly accommodations. If you want to escape the real world for a while, we can think of no better place to choose. Dream of a tropical island hideaway, and you’ll probably imagine the casitas at the Villas Delfines. Built above the ground on stilts, each casita has a high thatched roof and is wrapped by a wooden veranda. The design isn’t just about daydreams though – this is one of the most ecologically sound properties that we’ve seen. The thatched roof encourages the air to circulate in the spacious interiors, while the stilts allow any rain to soak into the ground quickly and keeps the room cool when temperatures soar. There are yet more ingenious features inside, but none of them are obtrusive or inconvenient for guests. 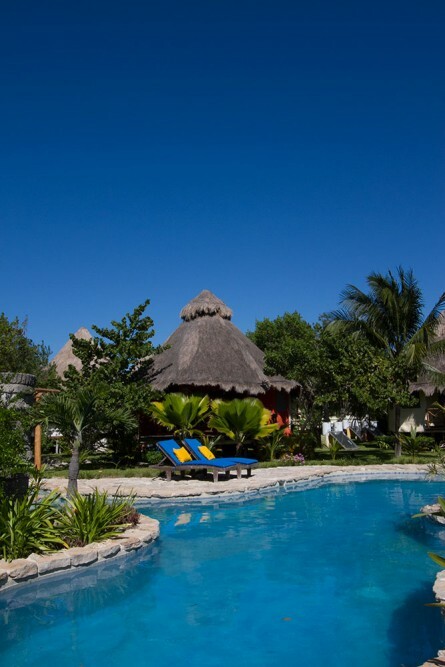 The gardens around the property are mature, and the casitas are separated by flourishing palms trees and shrubs. Most bungalows are very private, and even those that face the beach are fairly well screened from passers-by. Despite the foliage, the gardens enjoy a generous amount of sunshine through the day, while the terraces offer some welcome shade. 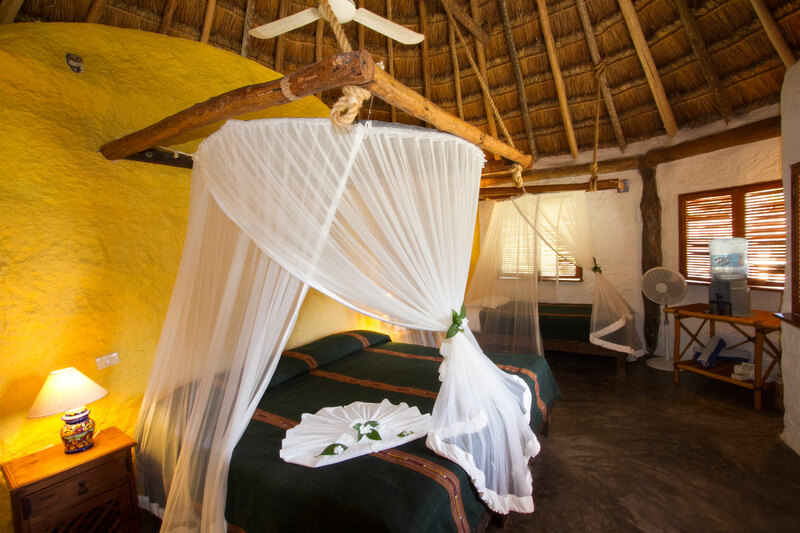 Deluxe Casitas now have air-conditioning, whilst the Garden casitas are cooled by ceiling fans. 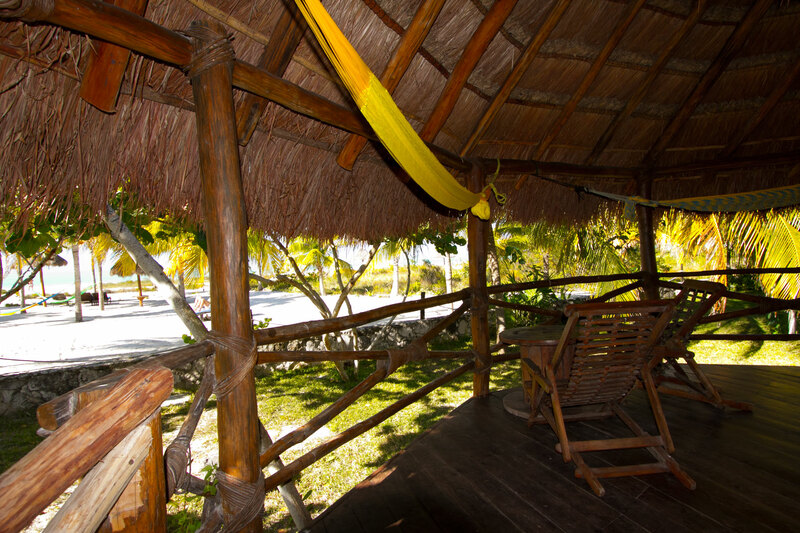 Individual bungalows with thatched roof, terrace and hammock. 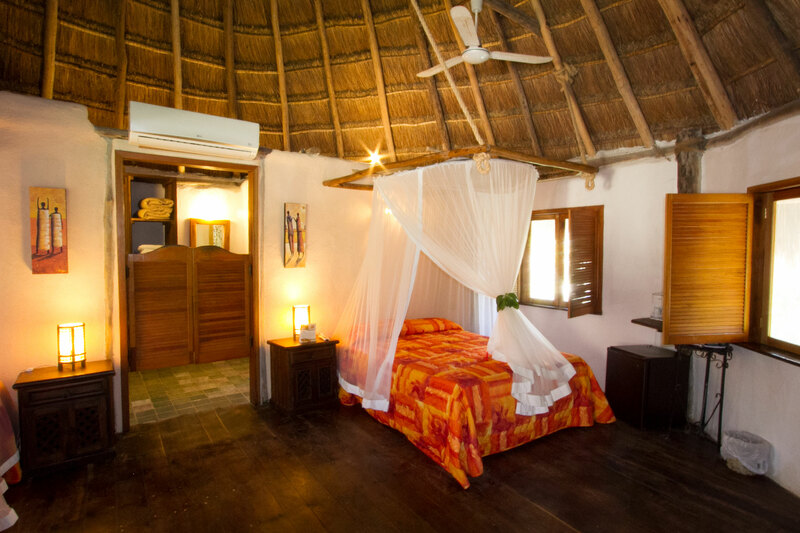 Both Garden and Deluxe bungalows have a similar design, with a soaring palapa roof and spacious interiors. All are very comfortable for a couple, a family or a few friends. The windows are well screened and also have shutters so there’s little chance of bugs getting into the room. 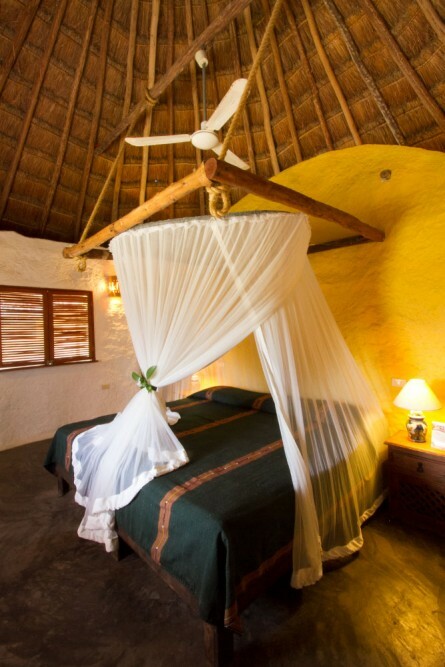 We never actually needed the canopy of netting over the bed, but liked the coziness it offered. 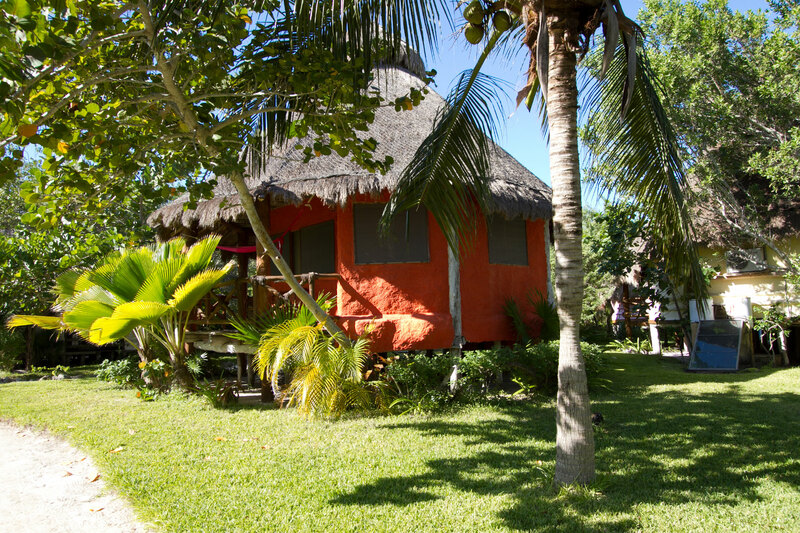 The Garden Casitas are the newest, and tucked away amongst the lush green foliage in the hotel gardens. 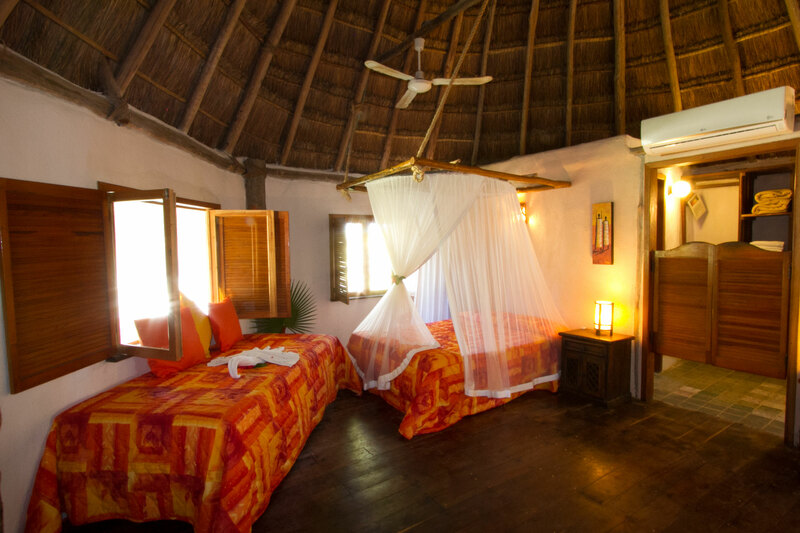 These Casitas have a King bed and a single day bed. There are two ceiling fans in the room and they are controlled individually – a useful touch if the occupants don’t agree on ideal temperatures for sleeping (there is often one fan above each bed). Other welcome features include a coffee maker, mugs and a good supply of coffee. Ample bottled water is provided free of charge in the rooms too. 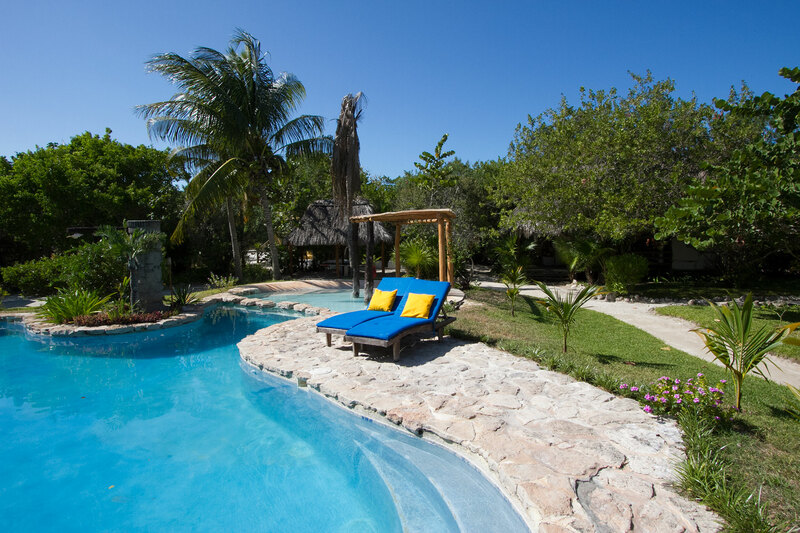 The wonderful terraces overlook pretty gardens and are large enough to accommodate two hammocks and additional seating, with plenty of space remaining. 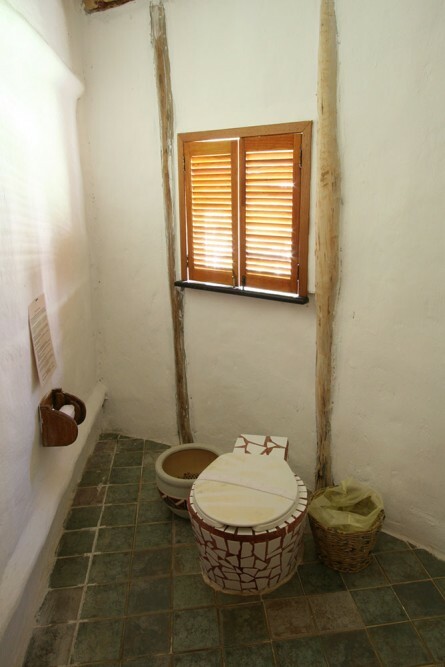 Bathroom facilities at the Villa Delfines are unconventional in design, but we were amazed by their effectiveness and simplicity to use. The Na Hi Xix composting toilet is completely organic and only requires that you add woodchips (no flushing, hence water requirements and waste output is minimized). This is one of the most efficient organic waste treatment systems available, and though it is expensive to install and operate, the benefits to the environment are huge. Almost like bathing outdoors, the showers at Villas Delfines are oversized and the water is fed through a wonderful seashell head. 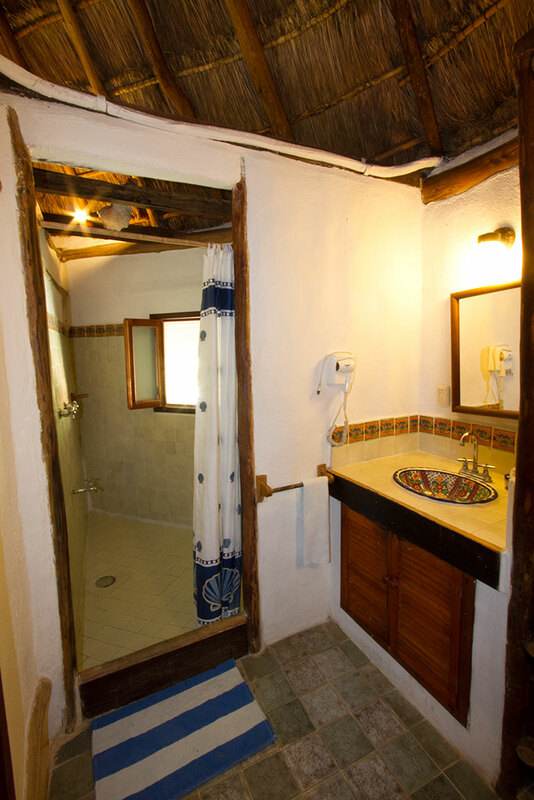 The water is solar heated, but again the system is very effective and we enjoyed ample hot water at any time of the day. 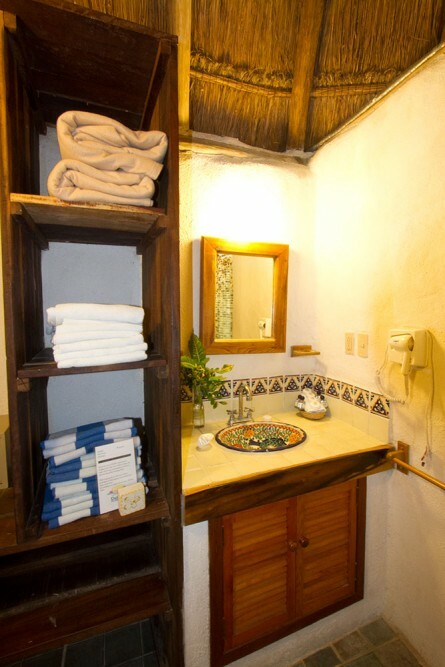 The bathroom is also equipped with a large vanity unit and half-length closets in a small dressing area. The Superior Casitas have two Queen size beds and the single/day bed. There are a few extras in the Deluxe casitas, including beautiful hard wood floors, fully-stocked mini-bars that are replenished daily, a small safe and a hair-dryer. 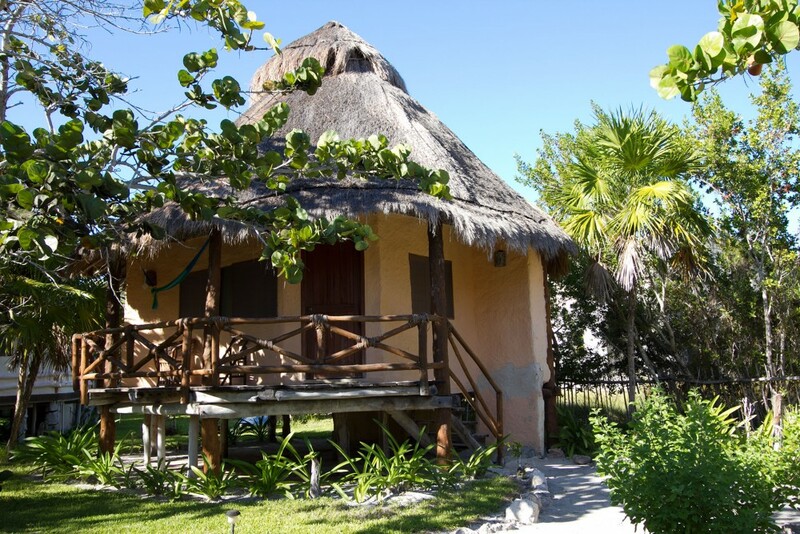 These casitas now have air-conditioning too, so they are a good choice if you’re visiting during the summer. 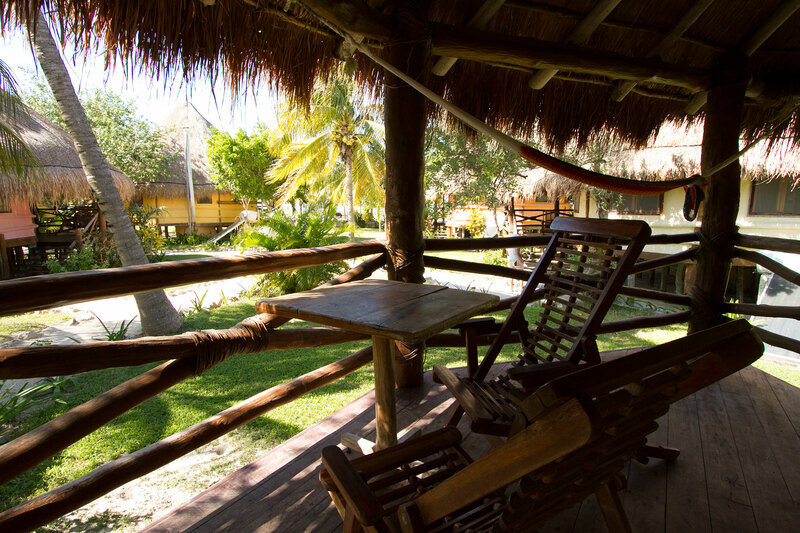 The smooth wooden flooring of the casita extends out onto the terrace, so you can wander out with bare feet and a cup of coffee first thing in the morning. It’s difficult not to relax in such a remote and tranquil location, and what better place to snooze or while away a few hours with a good book than this shady spot. 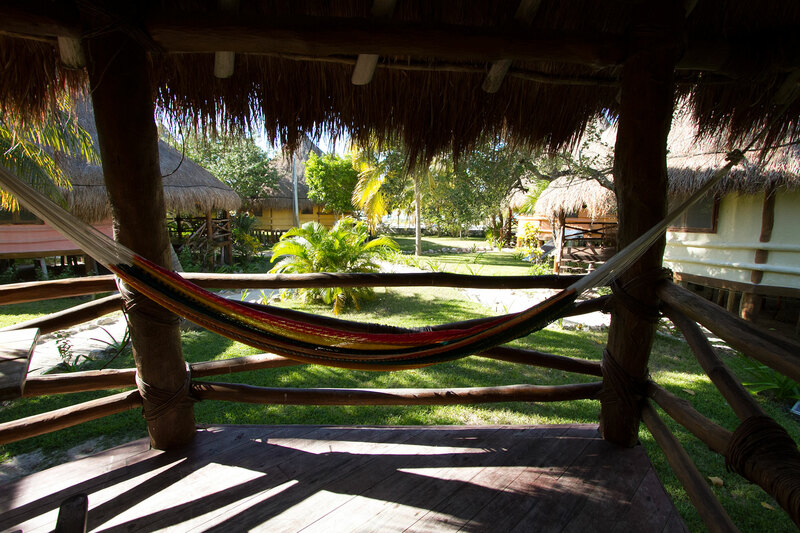 The terrace is furnished with chairs and a hammock, and you can glimpse the sea from most of these casitas. The four beachfront casitas are located on the perimeter of the propery, looking out across the sandy gardens and beach to the blue green sea. Since the sandy area is very extensive, it’s still a good distance to the water. 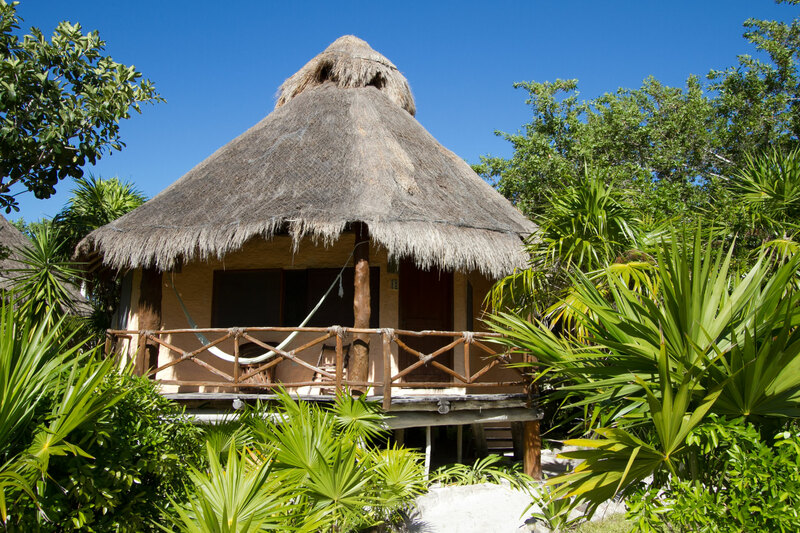 However, these bungalows are worth the premium for their uninterrupted vistas of palm trees and white sand. One of the casitas has a king bed and the others have two double beds plus a single bed. The restaurant El Canguay is the heart of the hotel, serving breakfast, lunch and dinner and remaining open for cocktails and other beverages until late at night. 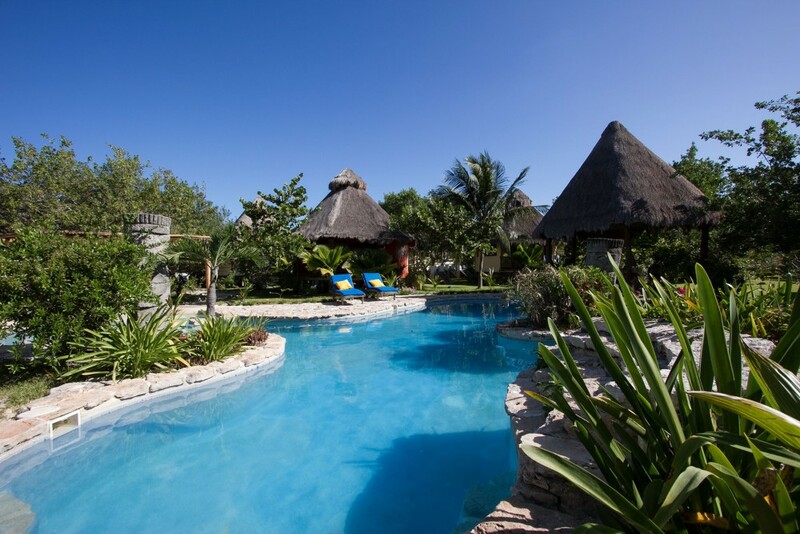 This is a casual, barefoot setting with a warm welcome and friendly service. The menu is extensive, although seafood is naturally a specialty – don’t miss the excellent ceviches or the tasty giant shrimp. It’s possible to walk or take one of the golf-cart “cabs” into town to eat at other restaurants too. 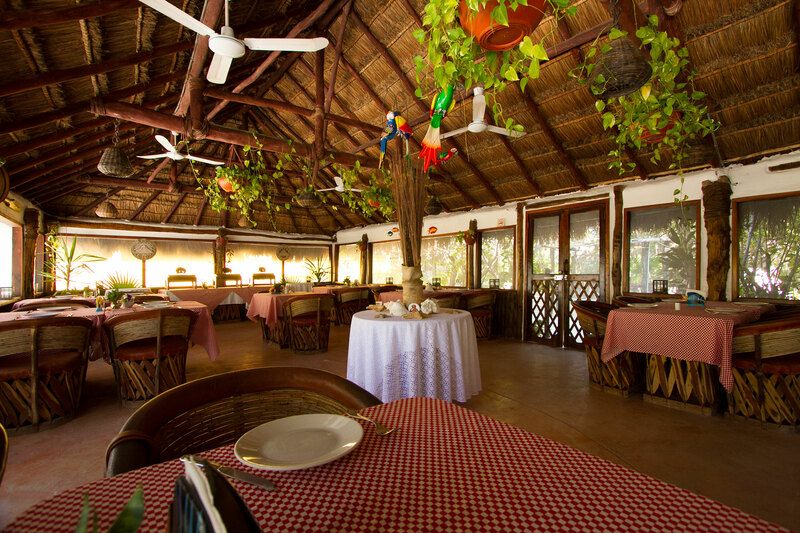 Breakfast features a buffet of fruit, juices, rolls, toast and yoghurt, with eggs and other hot dishes cooked to order at your request. 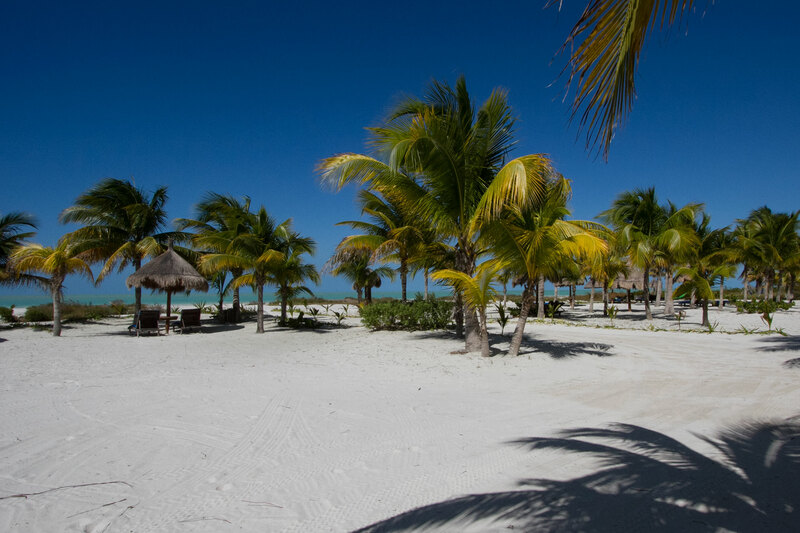 The white sand beach stretches as far as the eye can see. This is a natural beach, scattered with seashells and dotted with palm trees and sea grape, with colorful fishing boats anchored in the shallow waters. You may come across some seaweed or natural debris washed up by the ocean, but this is not likely to stop your enjoyment of the natural beauty of this amazing seascape. At sunset, we like to walk along the beach as far as the town, where there are several small restaurants and bars. 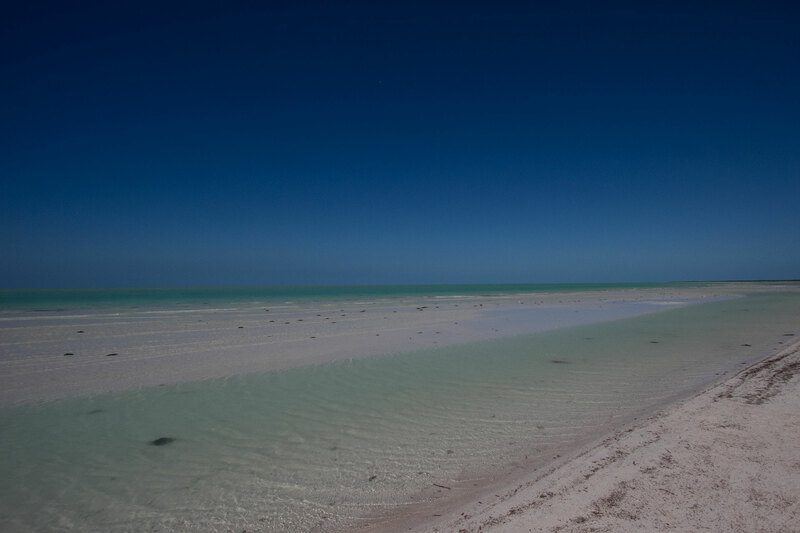 During the daytime, watch for dozens of flamingos flying over the island, or pelicans diving for their lunch. The refreshing freeform pool here is quite unusual and very attractive. 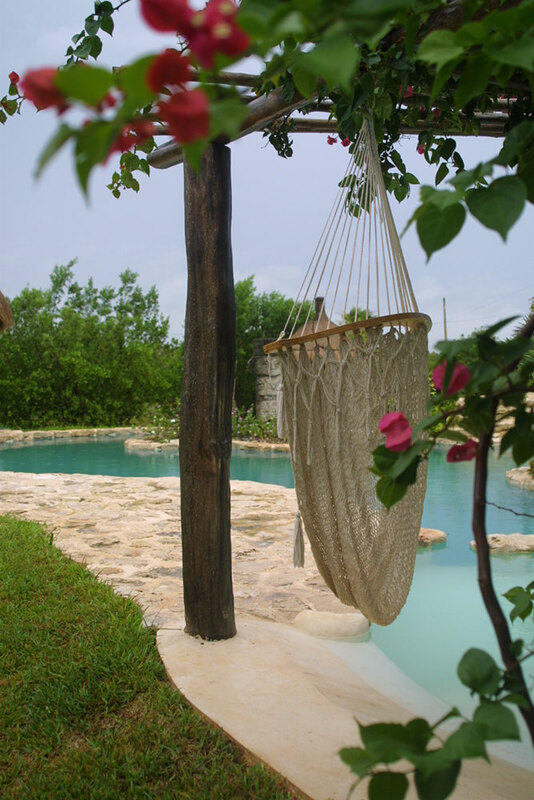 There is a hammock seat in the shade at the shallow end, bordered by Bougainvillea. This makes a wonderful spot to relax with a book. The shallows are separated from the deeper part, making it safer for children. There are some comfortable sunloungers, and a table and chairs in the shade. 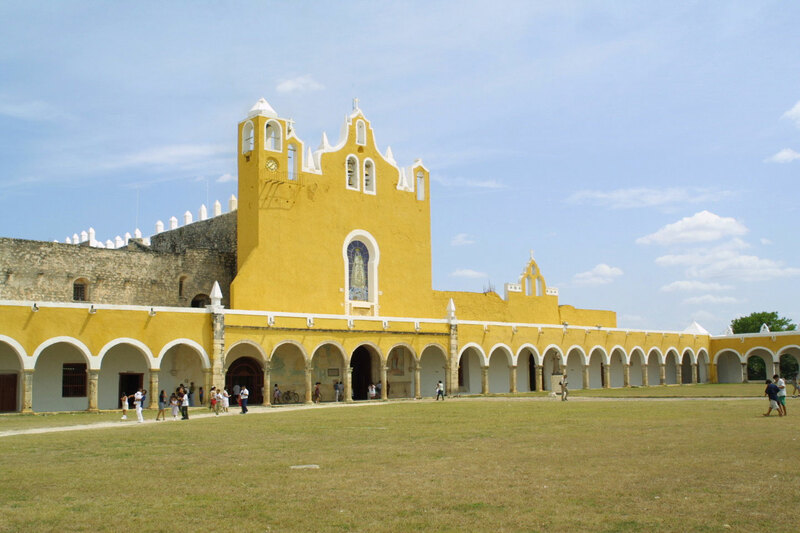 The closest airport is Cancun, about 95 miles away and the journey by car from Cancun to the port of Chiquila takes around 3 hours. 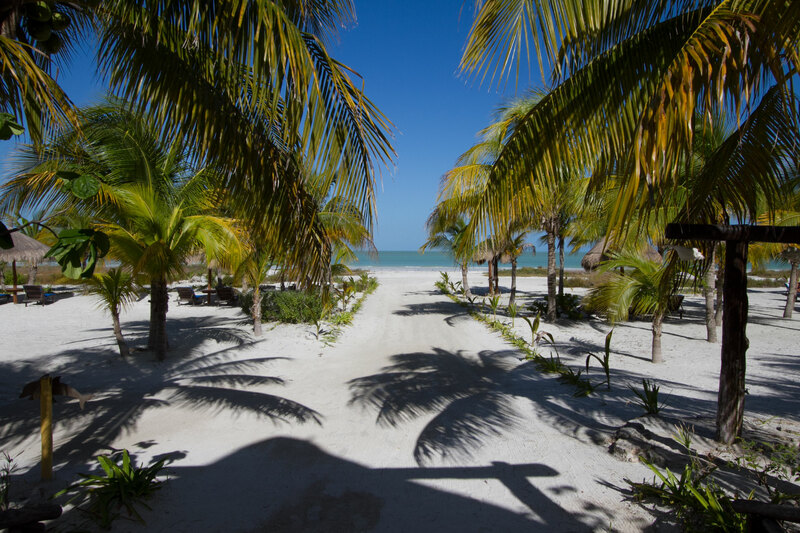 From Chiquila, there is a regular ferry service to Isla Holbox, and then golf cart taxis will take you to the hotel. 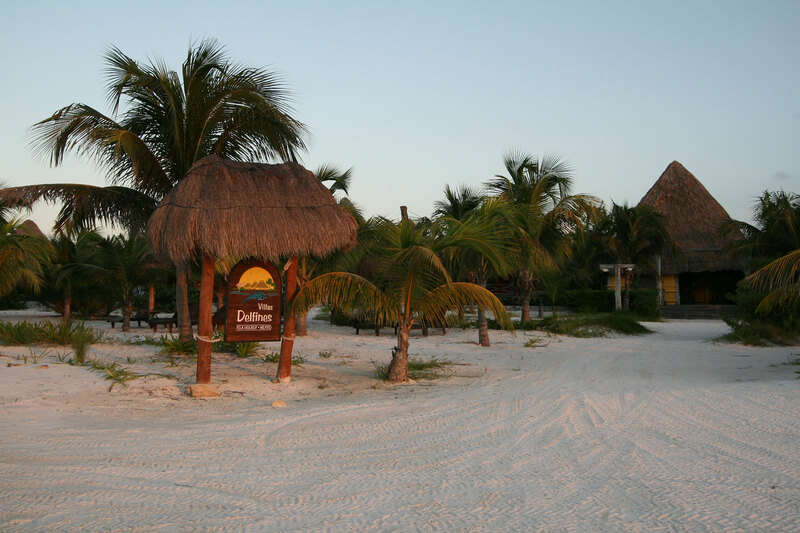 We recommend using the hotel’s door to door transportation service from Cancun airport to the property. From Cancun, take the free highway and NOT the toll (cuota) highway. After about 1 hour (approx. 40mi/60km) take the turning for Holbox/Chiquila that is well signed from the highway. There is a gas station close to this junction. After a further 6mi (10km), take the right turn for Chiquila. There is another gas station after a further 12mi (20 km). 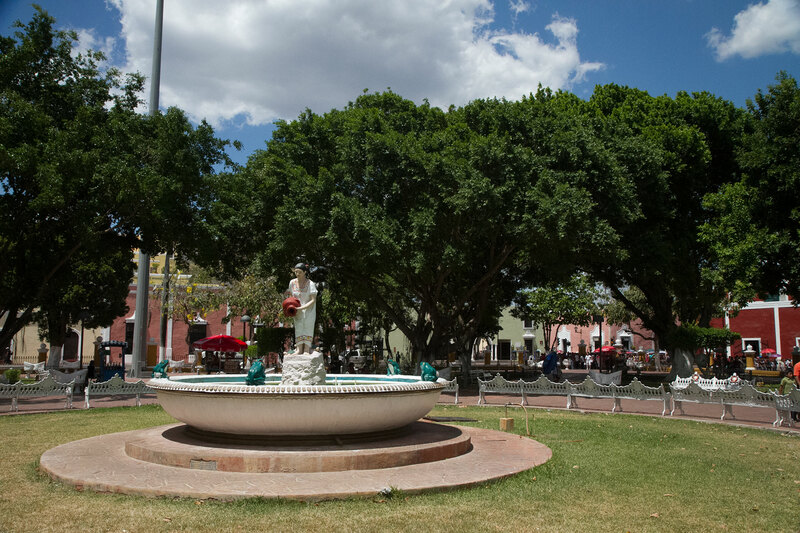 The little town of Chiquila is about 90mi (140km) from Cancun. You can leave your car in a guarded parking lot for around 25 pesos per day. There is an occasion car ferry but it’s really not worth taking your car to the island.